This 100-hour curriculum offers you a powerful opportunity to develop the core competencies of teaching in a whole-person learning model. Created by Carey Smith and presented by the Center for Embodied Teacher Education. In The Spirit of Learning you will: develop a confident and embodied teaching presence that will result in more successful learning outcomes; be able to lead your students (or clients) to access their inner and outer resources to achieve their professional goals; and create ongoing experiences that sustain and enrich you as a teacher, therapist, coach or manager. For 33 years, our entry-level training prepared people for successful massage therapy careers. 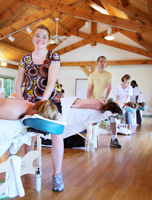 BTI graduates continue to serve the public by providing exceptional massage therapy in a wide variety of settings. These dedicated practitioners are highly sought-after for their clinical skill and therapeutic presence. We want to express our gratitude to all the teachers and students who have participated in continuing education at South Wind Farm. 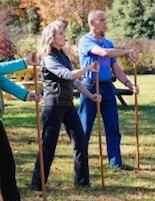 After three decades of sponsoring a broad range of continuing education workshops and advanced training programs, our focus will be on teacher training and somatics in 2019. We invite you to check back with our website or the BTI Facebook page to see what may be next!